of parkland, idyllic historical buildings, and plenty of shops, galleries, and eateries. Just one walk through the village is worth hours of enjoyment. From historic farms to renowned museums, Woodstock is home to a vibrant and celebrated culture for you to explore and experience. Takes a walk over the Ottauquechee River, past some of Woodstock’s most beautiful homes, on Middle Bridge, one of the most-photographed covered bridges in New England. Billings Farm and Museum offers a taste of traditional New England farm life circa 1890, with everything from butter-making to sheep-shearing demonstrations. Open Tuesday through Sunday, Woodstock’s premier whole foods market features produce, breads, meats, seafood, coffee, wine, microbrews, and more. Built in 1836 and overlooking the hydroelectric dam on the Ottauquechee River, this bridge is the second longest and third oldest bridge in Vermont. Whether you prefer vigorous bike rides or refreshing dips in the river, you’re sure to appreciate Woodstock’s picture-perfect outdoor setting. Anglers will certainly enjoy the many streams, rivers, and lakes available in this central Vermont location, offerings some of the best fly fishing in the nation. The Suicide Six ski area is one of the best small ski mountains in New England, with 23 alpine trails, including a new double black diamond glade trail and a snowboarding halfpipe. Make sure to visit Killington during your stay with us. If cross-country skiing is more your speed, the Tubbs Snowshoes and Nordic Adventure Center offers nearly twenty miles of groomed trails. From challenging mountain biking trails to great stretches of road, Vermont is home to great terrain for both casual riders and seasoned cyclists alike. Two of Woodstock’s three bridges offer access to swimming in the Ottauquechee River: the bridge at the end of Elm Street and the bridge adjacent to the Woodstock Recreation area. Visit the New England Falconry operation in Hadley, MA. Learn details about raptor adaptations, conservation, permitting and history of falconry, and experience free flying of the hawks. We may be New England’s quintessential small town, but the town of Woodstock is flourishing with creativity and artistic spirit. Woodstock is the only American town with five of the bells manufactured at the Massachusetts foundry once owned by Paul Revere. The earliest is on the porch of the Congregational Church. The 1807 Dana House Museum displays 19th-century art, toys, furniture, tools, and more, while the History Center features an extensive research library and archive. Built in 1883 by Dr. Edward Williams in loving memory of his parents, Norman and Mary, Woodstock’s beautiful red stone library occupies a central spot on the Green. Experience first run films and state-of-the-art Dolby digital sound on the biggest screen in the Upper Valley at the old-fashioned Historic Town Hall Theatre and Pentangle. From 1848–1898, Green Mountain Perkins Academy Museum was mainly a co-ed secondary boarding school. Today, this pristine structure and its many artifacts take you back 150 years. With nationally known dairy companies and, of course, our world-famous maple syrup, Vermont is a true leader in agriculture. Featuring locally grown products and local artisans, the Mount Tom Farmers’ Market is located in the Mt. Tom parking lot, Rte. 12, just one half mile north of the village. Vermont Farmstead Cheese produces artisanal old-world cheeses with Vermont quality, authenticity, and style. Visit their website for recipes, videos, and more. Six generations of sugar makers at the same location, Kedron Sugar Makers is open daily in season, while maple syrup is available year round at the Kedron Valley Stables. 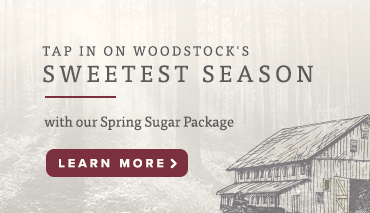 Sugarbush Farm features free tastings of cheese, maple syrup, and Vermont foods, as well as farm animals, a maple sugar house tour, and a nature walk. Cloudland Farm’s store has natural Angus beef, prepared foods, and Vermont products. The restaurant offers enchanting farm-to-table dining with seasonal menus crafted by their chef. With an eclectic selection of wonderful local restaurants to choose from, Woodstock is an ideal destination for casual diners and foodies alike. This French-inspired cafe, featuring sandwiches, salads, and pastries, is open daily for breakfast and lunch, with outside seating available during the summer. Eat in or take out at Maplefields, a 24-hour market with deli sandwiches, salads, pizza, breakfast sandwiches. Be sure to check out their daily specials. Mountain Creamery offers a casual atmosphere with generous portions and traditional breakfast. Remember, credit cards not accepted. Visit the Village Butcher Shop for to-go sandwiches and homemade donuts. Seating is available at outside tables or on the lawn of the Woodstock Historical society. This local and healthy Cambodian–Thai fusion restaurants is open for dinner Tuesday through Sunday, and yes, it really is BYOB. Caribbean Chef Diaz serves a menu inspired by his Puerto Rican roots at Melaza Bistro, a quaint eatery featuring a full bar. Featuring classic American fare with an international flare, this long-running establishment offers an elegant yet subtle atmosphere. Reservations encouraged. Bentley’s is a traditional American bar and grill, open daily for lunch and dinner with entertainment on Fridays and Saturdays. This modest pizza place features a large variety of delicious pizza, subs, and salads in a fast and friendly environment. Located in the Woodstock Inn, the Tavern provides a casual dining experience while the Red Rooster is formal with New American cuisine. Offering fresh, farm-to-table meats and produce and an ample line of specialty beers, this rustic diner is open for drink and dinner daily.